Saturday, November 11, 2017 at 7:00 p.m. The Madison Gospelaires and Mad City Funk. $10.00 at the Door for Veterans and Unemployed. Advance tickets only available on-line and by phone at (608) 241-8633, with $2.00 credit card convenience charge. SATURDAY NOV. 11, 2017 at 7pm at the BARRYMORE THEATRE, 2090 Atwood Avenue in Madison, WI. $15 at the door ($10 for veterans and unemployed). “When I was a boy…all the people of all the nations which had fought in the First World War were silent during the eleventh minute of the eleventh hour of Armistice Day, which was the eleventh day of the eleventh month. It was during that minute in nineteen hundred and eighteen, that millions upon millions of human beings stopped butchering one another…Armistice Day has become Veterans’ Day. Armistice Day was sacred. Veterans’ Day is not.” – Kurt Vonnegut, World War II veteran and author. “Armistice Day was a hallowed anniversary because it was supposed to protect future life from future wars. Veterans Day, instead, celebrates “heroes” and encourages others to dream of playing the hero themselves, covering themselves in valor.” – Rory Fanning, Iraq War veteran and conscientious objector. “This year with a rise of hate and fear around the world it is as urgent as ever to ring the bells of peace. We in the U.S. must press our government to end reckless rhetoric and military interventions that endanger the entire world. Instead of celebrating militarism, we want to celebrate peace and all of humanity.” -Veterans for Peace 2017 action statement. 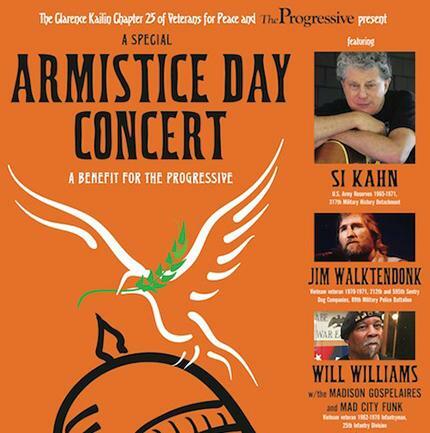 Legendary folk musician and community organizer Si Kahn is returning to Madison this November for a special benefit concert on Armistice Day. Kahn will perform at the Barrymore Theatre on Saturday November 11th at 7pm along with Vietnam veteran musicians Jim Walktendonk and Will Williams, together with the Madison Gospelaires and Mad City Funk band. 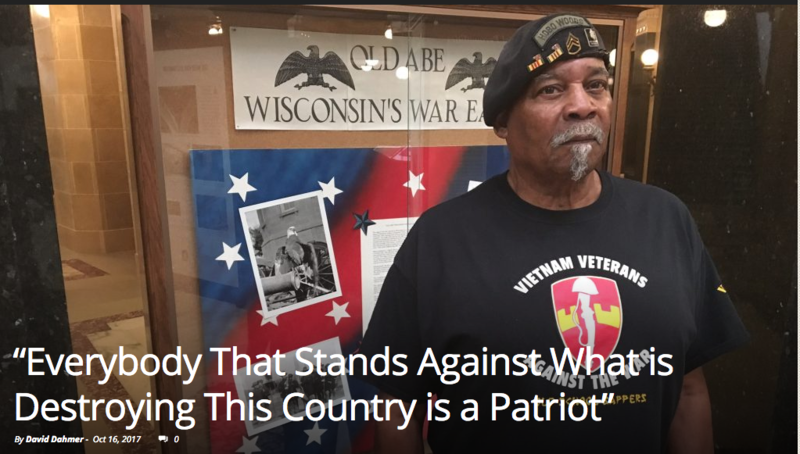 The show, co-sponsored by the Clarence Kailin Chapter 25 of Veterans For Peace and The Progressive magazine will be a benefit for The Progressive celebrating 108 years of publishing in Madison. 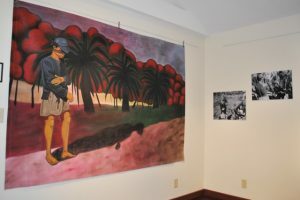 David Giffey, artist and former combat journalist will emcee the show. Si Kahn has been a musician and organizer for over 50 years, beginning as a volunteer with the Student Nonviolent Coordinating Committee in Arkansas during the Civil Rights movement. He has continued to live and work in the South, assisting in union struggles, working against the privatization of prisons, and most recently with “Musicians United,” a group working to protect the environment in Bristol Bay, Alaska. He has also written numerous theater works including “Joe Hill’s Last Will,” which was performed in Madison by John McCutcheon in 2015. The Clarence Kailin Chapter 25 of Veterans For Peace is named for the late Spanish Civil War vet whose life was a model for a generation of activists in a variety of movements for peace, justice, and equality. Members will be on hand to share information about their current projects. The Progressive magazine was founded by “Fighting Bob” La Follette in January 1909. It has continued since that day as a voice for peace, social justice, and the common good. The print edition of the magazine is published bi-monthly, with daily content appearing on the web at www.progressive.org. This years benefit concert is built around the theme, voiced by Veterans for Peace nationally, that November 11th should return to its roots as a day for peace – calling for an end to all wars as it did 99 years ago. Advance tickets only available on-line at www.barrymorelive.com and by phone at (608) 241-8633, with $2.00 credit card convenience charge. For more information, contact the Barrymore at 608-241-8864 or The Progressive at 608-257-4626. 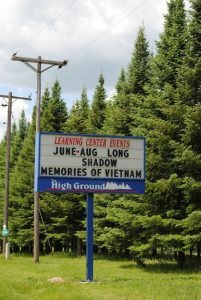 This entry was posted in Clarence Kailin Chapter 25, Veterans for Peace, Vietnam and tagged Armistice Day, The Barrymore Theater, The Progressive, Veterans for Peace on November 9, 2017 by Website Administrator. This op-ed originally appeared on madison.com. Remember Armistice Day? Unless you were socially aware before 1954, or had an exceptional history teacher, probably not. I didn’t. The day we now honor solely as a tribute to military veterans has its roots in a national dedication to peace. Consider the history. America’s founders believed war would be a temporary state until the country got off the ground. They viewed a standing army as a threat to our fledgling democracy. A nation with a ready military would be more likely to use it. The result would be a potentially unsustainable tax burden on citizens to support the army and the wars. Unfortunately, the day to “solemnly remember the sacrifices of all those who fought so valiantly” has romanticized war. Talk of peace is seen as unpatriotic and a disservice to veterans. My own deployments have taught me that no one desires peace more than a soldier. We have seen firsthand the inglorious brutality of war and its vicious cycle of pain and retribution. As a veteran, I believe nothing makes our nation greater or honors my service better than celebration to resolve world conflict through peaceful and diplomatic means. 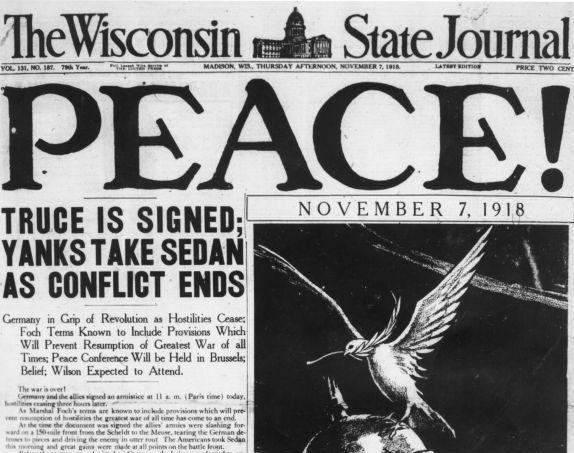 Can a day to honor veterans coexist with a return to the original spirit of Armistice Day? Absolutely. The best way to honor a veteran is to celebrate peace. Wiedenhoeft, of Madison, is a veteran of wars in Iraq, Afghanistan and Desert Storm, and a member of Veterans for Peace, Chapter 25. This entry was posted in Armistice Day, Veterans for Peace and tagged Armistice Day, Nation, Soldier, United States, Veteran, war on November 30, 2016 by Website Administrator.